My daughter Ellen wrote this post last year for Rare Disease Day. We repost it today. It's frustrating that, in the age of genetics, when finding single genes for rare diseases is what the field does best, she is still seeking answers. February 29 is Rare Disease Day; the day on which those who have, or who advocate for those who have, a rare disease publicly discuss what it is like to live with an unusual illness, raise awareness about our particular set of challenges, and talk about solutions for them. 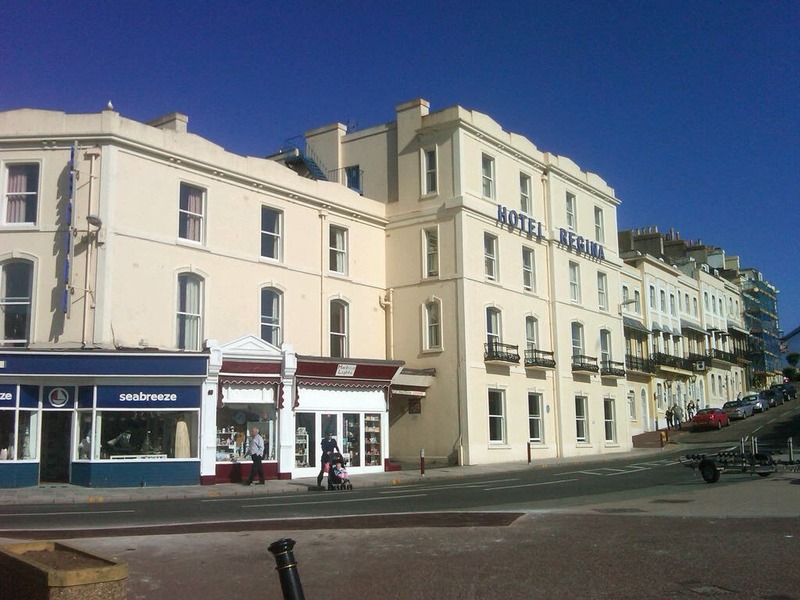 In the spring of 2011, Ken and I took a bit of a pilgrimage to England. We were moved by following Darwin's footsteps in Malvern, as we described here, and even to see the gravesite of his beloved daughter Annie, but the real goal of that trip was to find several of the places that were important to the Victorian poet Elizabeth Barrett Browning when she was young. 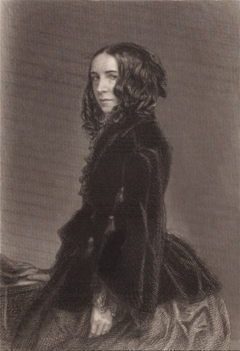 Barrett Browning was ill for most of her life, with a disease that her doctors were unable to diagnose during her lifetime, and which medical historians have been unable to definitively diagnose since. However, while reading her letters to Robert Browning, and much more of her writing, because our family has been touched by the same rare disease, it dawned on us that we knew what she had. We have blogged about this a few times but it seems fitting to re-publish that post today because it's Rare Disease Day 2016, a day established by a number of rare disease alliances and organizations around the world to raise awareness of the impact of rare diseases on patients' lives. A new paper online in the Journal of Physiology ("Physical exercise increases adult hippocampal neurogenesis in male rats provided it is aerobic and sustained," Nokia et al. ), and described here by the NYT, reports that running is good for the brain. At least the rat brain. It has already been well-established that aerobic exercise is associated with an increase in adult hipocampal neurogenesis, the number of neurons in the hippocampus, the region of the brain associated with producing long-term memory among other functions. But, Nokia et al. wondered if it was only aerobic exercise, or whether other kinds of exercise have the same effect. So they compared the number of neuronal cells of mice subjected to high-intensity interval training, resistance training and distance running. They found no increase in the rats who did resistance training compared to sedentary rats, and a smaller than expected increase in rats that did the interval training. It was only in the brains of the rats who did aerobic exercise that neurogenesis was significantly increased. The authors hypothesize that this is because running stimulates the production of brain-derived neurotrophic factor and insulin-like growth factor, which are associated with neurogenesis. The more aerobic exercise the animal does, the more of these the animal produces, and thus the more neurons. Currently the best advice for preventing dementia in old age is to maintain a social life, quit smoking, and exercise. And, if this rat study can be applied to humans, this should at least qualify that as aerobic exercise; running or biking, say. As with all such lifestyle advice, this surely won't work for everyone, but the evidence is increasingly in its favor, at least on a population basis. But there are deeper implications of this work, I think. If exercise changes the architecture of the brain in ways that can affect learning, even in adults, and, as has been repeatedly demonstrated, stimulating children by reading to them, using lots of words, playing music to them, and so on, or the reverse, growing up in poverty, or with disease, or amid famine all can affect brain architecture and thus cognitive ability for better or for worse, why do so many continue to privilege genes and genes alone -- or even more, a single gene -- for the creation of intelligence? It seems that the brain responds to experience at all ages, but it's possible that there's a 'sensitive period' for cognition. As just one example, the cognitive abilities of children reared in institutions in Bucharest were compared to that of children never placed in an institution to those whose lives began there but who moved to foster care before age two. Those who were reared entirely in institutions had much lower cognitive ability than the other two groups; the cognitive abilities of those who were moved to foster care before age two significantly improved. The authors of this study suggest that there may be a sensitive period for developing cognitive ability, just as there is one for learning language, and many other aspects of brain function. Of course, as with any trait, genes play a crucial role in the development of the brain. But they don't do it alone. E.g., a 2010 paper in Child Development describes the genetic underpinnings of the developing brain, but its plasticity as well. The foundations of brain architecture are established early in life through a continuous series of dynamic interactions between genetic influences and environmental conditions and experiences (Friederici, 2006; Grossman, 2003; Hensch, 2005; Horn, 2004; Katz & Shatz, 1996; Majdan & Shatz, 2006; Singer, 1995). There is increasing evidence that environmental factors play a crucial role in coordinating the timing and pattern of gene expression, which in turn determines initial brain architecture. Because specific experiences potentiate or inhibit neural connectivity at key developmental stages, these time points are referred to as sensitive periods (Hess, 1973; Knudsen, 2004). Each one of our perceptual, cognitive, and emotional capabilities is built upon the scaffolding provided by early life experiences. Examples can be found in both the visual and auditory systems, where the foundation for later cognitive architecture is laid down during sensitive periods for basic neural circuitry. Genetic determinists might acknowledge the plasticity of the brain but then say that how the brain responds to experience is what's genetically determined, and thus that there are children who just aren't genetically equipped to be the next Einstein, or even to learn calculus. We know this is true at least at one extreme of the distribution of intelligence, because there are many alleles known to be associated with low cognitive ability. These usually cause syndromic conditions, however, so aren't related only to how quickly synapses are crossed, or memories made, or whatever it is that underlies -- or defines -- intelligence. As with many other trait distributions, what happens at the extremes doesn't necessarily represent what's going on in the middle, so I think the jury is still out as to the overriding importance of single or even a small number of alleles in the development of normal or above normal intelligence (again, whatever that is -- for the moment, let's call it the ability to score well on IQ tests). And indeed no genes with large effects on intelligence have yet been identified, despite decades of looking. That has so far included comparison of the tails of the distribution among individuals without a clear-cut pathology. So, of course there are genes involved in how quickly people think, or make connections between ideas, or memorize, or invent things, or remember -- how people learn. But it's not either mainly genes or environment. It's both, interacting, and molding the reactive brain. There is enough evidence now to show that the brain is a hungry organ, soaking up and responding to experience at all times, throughout life. Whether or not we believe that society should be investing in optimizing the environment of every child to maximize their potential is a social and political decision, not a scientific one. The previous posts in this series were about the potential relevance of somatic mutation to neurologically relevant traits. I commented about ideas I've long had about the possible genetic etiology of epilepsies, but then about the more general relevance of somatic mutation for behavior and other less clinical traits, indeed, to positively beneficial traits. But the issues go much farther! Every science has fundamental units at the bottom of their causal scale, whose existence and properties can be assumed and tested, but below which we cannot go. The science is about the behavior or consequences of these units and their interactions. The fundamental unit's nature and existence per se are simply assumed. Physicists generally don't ask what is inside a photon or electron or neutron (or they say that these 'particles' are really 'waves'). In that sense, fundamental 'causes' are also defined but not internally probed. They don't really attempt to define 'force' except empirically or, for that matter, 'curved space-time'. You simply don't go there! Or, more precisely, if and when you venture into the innards of fundamental units, you do that by defining other even more fundamental units. When string theory tries to delve into unreal dimensions, they leave most other physicists, certainly the day-to-day ones behind. Generally, I think, physicists are usually more clear about this than biologists. The same in mathematics: we have fundamental axioms and the like that are accepted, not proven or tested. Why is somatic mutation considered to be some sort of side-show in genetics? What are biology's fundamental units? For historical reasons, evolutionary biology, which became much of the conceptual and theoretical foundation for biology, was about organisms. Before the molecular age, we simply didn't have the technology to think of organisms in the more detailed way we do now, but thought of them instead as a kind of unit in and of themselves. Thus, the origins of ecology and phylogeny (before as well as after Darwin) were about whole organisms. Of course, it was long known that plants had leaves and animals had organs, and these and their structures and behavior (and pathologies) were studied in a way that was known to involve dissecting the system from its normal context. That is, organs were just integral parts of otherwise fundamental units. This was true even after microscopes were developed, Virchow and others had established the cell theory of life. Even after Pasteur and others began studying bacteria in detail, the bacterium itself was a fundamental unit. But this was a major mistake. Dissecting organs to understand them did, when considered properly, allow the identification of digestion, circulation, muscle contraction, and the like. But the focus then, and still today in the genetic age, on the whole organism as a basically fundamental unit has had some unfortunate consequences. We know that genes in some senses 'cause' biological traits, but we treat an organism as a fundamental unit with a genotype, and that is where much trouble lies. The cell theory made it obvious that you and I are not not just an indivisible fundamental unit, with a genotype as its fundamental characteristic. Theories of organisms, embryology, and evolution largely rest on that assumption, but it is a mistake, and somatic mutation is a major reason why. The cell theory, or cell fact, really, makes it clear that you and I are clearly not indivisible causal units with a genotype. We know beyond dispute that cell division typically involves at least some DNA replication errors--'errors', that is, if you think life's purpose is to replicate faithfully. 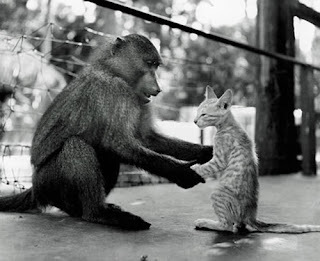 That itself is a bit strange, because life is an evolutionary phenomenon that is fundamentally about variation. Perhaps like most things in the physical world, the important issues have to do with the amount of variation. The number of cell-divisions from conception through adulthood in humans is huge. It is comparable to the number of generations in a species, or even a species' lifespan. Modern humans have been around for, say, 100,000 generations (2 million years), far fewer than the number of cell divisions in a lifetime. In addition, the number of cells in a human body at any given time is in the many billions, and many or even most cells continue to renew throughout life. This is comparable to the species size of many organisms. The point is that the amount of somatically generated variation among cells in any given individual is comparable to the amount of germline variation in a species or even a species' history. And I have not included the ecological diversity of each individual organism, including the bacteria and viruses and other small organisms on, in, and through a larger organism. By assuming that somatic mutational variation doesn't exist or is trivially unimportant--that is, by assuming that a whole organism is the fundamental unit of life, we are entirely ignoring this rich, variable, dynamic ecology. Somatic mutation is hard to study. There are many ways that a body can detect and rid itself of 'mutant' cells--that is, that differ from the parent cell at their bodily time and place. But to treat each person as if s/he has 'the' genotype of his/her initial zygote is a rash assumption or, perhaps a bit more charitably, a convenient approximation. In the same way that we can understand the moon's orbit around the earth by ignoring the innards of both bodies, so long as we don't care about small orbital details, we can understand an organism's life and relations to others including its kin, by ignoring the internal dynamics that life is actually mainly about. 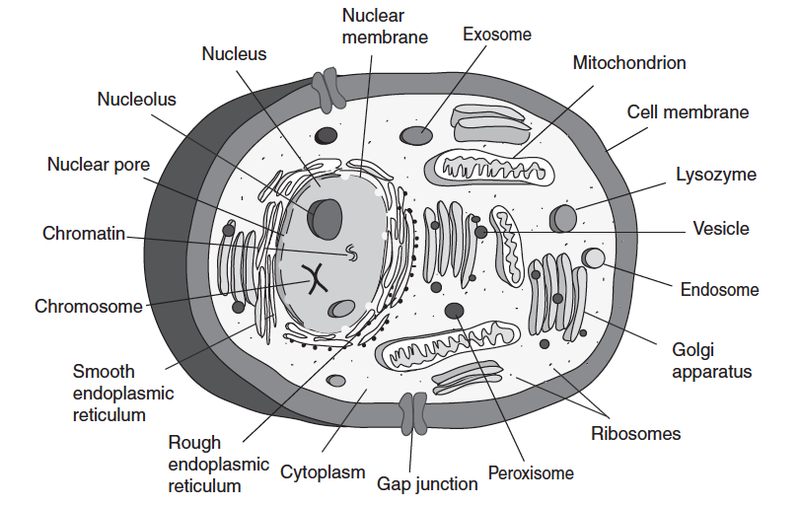 But much of what the whole organism is or does is determined by the aggregate of its nature and the distribution of its genotypes over its large collections of cells. We have been indulging in avoiding inconvenient facts for several decades now. Before any real reason to think or know much about somatic mutation (except, for example, rearrangements in adaptive the immune system), the grossness of approximation was at least more excusable. But those days should be gone. Geneomewide mapping is one example, of course. It can find those things which, when inherited in the germline and hence present in all other cells (except where it's been mutated), affect particular traits. Typically, traits of interest are found by mapping studies to be affected by tens, hundreds, or even thousands of 'genes' (including transcribed RNAs, regulatory regions etc.). Each individual inherits one diploid genotype, unique to every person, and then around this is a largely randomly generated distribution of mutant cells. When hundreds of genes contribute, it just makes no sense to think that what you inherit is what you are. It should also be noted that we have no real way even to identify the 'constitutive' genome of an organism like a person. We must use some tissue sample, like blood or a cheek swab. But those will contain somatic mutations that arose subsequent to conception. We basically don't look for them and indeed each cell in the sample will be different. Sequencing will generally identify the common nucleotide(s) at each site, and that generally will be the inherited one(s), but that doesn't adequately characterize the variation among the cells; indeed, I think it largely ignores it as technical error. The roles and relevance of somatic mutation might be studiable in comparing large-bodied, long-lived species with small ones in which not many cell divisions occur. They might be predicted to be more accurately described by constitutive (inherited) genomes, than larger species. Likewise plants with diverse 'germ lines', such as the countless meristems in trees that generate seeds, compared to simpler plants, might be illuminating. How to understand and deal with these realities, is not easy to suggest. But it is easy to say that for every plausible reason somatic mutation must have substantial effects on traits good, bad, and otherwise. And that means that we have been wrong to consider the individual to be a fundamental unit of life. I've been discussing a new paper in Cell that describes a detailed study of mouse embryonic neural cell culture that finds evidence for widespread mutations of a particular sort, occurring across the genome. The detected effects often involve genes that are involved in the function of synapses, the connections between neurons that are fundamental to the way the brain works. I am interested in the possibility that these changes may be contributors to epilepsy. But these are in the same genes in which inherited mutations could have potentially relevant effects on intelligence, behavior, or personality. In epilepsy as in other psychiatric, behavioral, and neurological traits, the total etiology of any given instance is likely to involve many genetic variants with mainly minor individual effects (that is clearly what mapping has consistently shown), The somatic mutation would be contributors to the mix. The relevance of the paper to neurological and psychiatric diseases in general, is obvious. If the genetically driven behavior of enough neurons goes awry, the person as a whole may manifest the result in the form of important impaired function, or even serious disease that threatens not just aspects of lifestyle but viability as well. Another way to put it is to say that these somatic mutations may contribute to our individuality as people. I have suggested in the two previous parts of this series that epilepsies, not mentioned by the Cell authors, may be added to their list. But things could have much more profound impact than on occasional dysfunctional traits. Neural somatic mutation of the sort reported in cell culture might also have important effects on a much broader array of normal mental traits. Indeed, that is far more likely than that somatic mutation only affects abnormal traits. And the broader range of non-pathological effects, which I think likely, has potentially deep societal implications. Personality and what we call 'intelligence', typically as measured by IQ tests, are important to our social fabric. Personality affects the way one interacts with others and fits within the constraints of society, and can have serious implications for the quality of life. Indeed, personality traits, including but not limited to intelligence, are used by society to sort out access to resources--wealth, power, influence, health, safety, and even basic rights. Those with impaired mental function are, for example, more likely to be homeless or perhaps in some instances to commit violent acts or to act sociopathically. Of course, we should not just think in terms of the stereotypical social bad guys: it is not usually recognized, but some who have wealth and power and are nominally considered successful could in every sense be called sociopaths, as well. Beyond this, and even more sensitive, is the issue of group characteristics, especially those putatively attributed to 'race' or ethnicity. There has been discussion going back at least to Plato, and including Darwin and his followers up to the present day, about how the 'better' (privileged upper) classes were the ones who are the important leaders, but whose valuable patrimony (that is, genes) are transmitted less often than those of their lesser compatriots. Whole classes of people might be superior or inferior because of genetic variants found disproportionately in one class and not in others. To be blunt: the professoriate and other privileged classes, who often invoke class-based genetic value inherency as if they are the Darwinian favorites, don't like to acknowledge the fact that the slovenly masses out-reproduce the well-groomed elite. The elite naturally find this threatening and unpleasant, and even concoct evolutionary arguments why this is a problem that needs curing (e.g., to keep our species from going downhill). That's weird, since by any reasonable Darwinian criterion the masses are the evolutionarily successful ones, as I've recently written (a copy available from me on request)--but we'll set that truth aside for the moment. Anyway, the relevance to this series of posts on neural somatic mutation is direct. That's because the issues just discussed are often if not typically couched in terms of the inherent worth of the worthies relative to their inferiors, and that in our time, routinely attributes the difference to genes. Not only are there issues about individuals and whether specific genes confer behavioral traits (like how you vote, how you respond to abuse, sociopathic behavior, and of course intelligence), but these traits are often, and persistently, applied to groups--in the US this means 'races'. Members of this race are often said to be smarter than members of that race because of their better genes. This is, of course, nothing new. There has been more than a century of heated debate about whether traits of individuals are inherited, inborn, and therefore largely unchangeable, or whether they are the result of circumstances of each person's life and can be molded by environments and experience. This is now often called the 'Nature-Nurture' debate, but it goes back in history (some biblical tribes were supposedly cursed, and hence made inferior, by God for their sins, for example). Scientific rather than blatantly political views on the subject can be traced, for example, to Linnaeus and his time's ranking of human races. Moving toward an attempt to make differences and evolution scientific, Lamarck suggested around 1800 that traits were modified by individuals' habitual behaviors, the result then being inherited in their offspring. Darwin's ideas about natural selection changed the putative mechanism a bit, but not the idea of adaptive change, meaning improvement. Racial hierarchies were a part of the assertions, and often still are. Then and since, major political movements across the political spectrum, each bolstered by some form of 'theory', including both eugenics and Marxism, have largely rested on opposing arguments within this purportedly scientific context. Today, there are scientists and other authors who passionately deny the existence of race and who argue that most of societally relevant behavioral traits are the result of circumstances, while others argue that, no, we are what we inherit. The latter point to the clear evidence of 'heritability' of behavioral traits, especially including but by far not limited to, intelligence. Parent-offspring or sib-sib correlations, for example, suggest that up to, say, 50% of variation in these traits can be accounted for by genetic variation. This is then extended to assertions of inherent traits of groups, such as traditional 'races', attributing societal success to inherent worth. This in turn is used, for example, to justify differential resource allocations, such as of educational funds. Many scientists, even prominent ones who actually know some genetics, as well as passionate racists and other hyper-determinists, take this position. Meanwhile, others point with equal passion to shared household environments and rigid social structures, and argue that if those in the poor, lower-achieving parts of society had as many books, ballet lessons, and resources, Kaplan test-prepping courses, and learned as many different words as those in more privileged parts of society, and inherited as much from their parents, they'd end up just as successful. They argue that genetic Darwinism is being abused to justify societal inequality. But what does neural somatic mutation have to do with any of this? For the purposes of argument, let's assume that genetic variants do provide important aspects of one's personality, abilities, and psychological health. There is plenty of evidence from known genes in which variants (alleles) can essentially cause at least some severe psychological problems, so why not more generally? Persons inheriting harmful variants in those genes are, truly, impaired. If they reproduce, their children would have the usual Mendelian odds of inheriting the same effects. This doesn't by any means justify depriving the victims of resources and, indeed, a more benign societal view would be that they should be provided more resources so they can reach their potential. However, that is a purely societal question, unrelated to the fact of causation. The genetic determinist view would ask: How can the same sort of genetic effects not apply also for traits within the normal range? Those who counter with environmental accounts of personality and the like argue that you are what has happened in your life, from gestation onward, and that is malleable but not heritable in your children. Scars from early childhood may doom someone's lifetime success, but while unfortunate or even tragic, they're not biologically inherited (unless they are in utero environmental effects, but even those can be 'erased' with better environments because they're not etched into the DNA). If society will but apply them, environmental improvements will lead to performance improvements: our brains are not hard-wired for specific functions but are hard-wired as learning devices. We are what we learn: that is the whole 'point' of the evolution of intelligence! Somatic mutation falls in between these two views. In a sense, though not due to any specific environmental exposure or experience, the effect of somatic mutations is to make you be what has happened during the genesis of your neural system. Somatic mutations could affect what one can achieve, just as rabid genetic determinists argue. 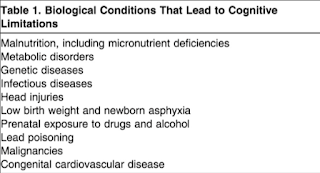 Of course, it isn't just impairments that might be involved, because exceptionally positive effects are likely, but we have far less genetic information on that than on disease or impaired function. In any case, performance abilities due to somatic mutation would not be heritable, just as the angry environmentalists insist. In fact, and I think the Cell authors mentioned something like this, one can envision reasons why high mutability could generate high mental flexibility and adaptability, much as the immune system generates high antibody diversity to be able to respond to unforeseeable pathogens. Non-heritable, environmentally non-specific neural variation could be a generic adaptation akin to immunity. The Cell paper is just one paper and though it cites other relevant literature, its importance for me is that it shows the potential value of thinking about somatic mutation in the neurological context. As I finished writing this post, my copy of the January Nature Reviews Genetics arrived. An article by Vissers et al. describes genomewide mapping results for 'intellectual disability and related disorders. One figure shows that, if you believe the strength and credibility of the evidence, around 700 'genes' (whatever that means--e.g.., whether just genome regions or only protein-coding regions) associated with these traits. The identification pattern doesn't suggest that most genes have as yet been identified. And this is only about disorders. It will be some time before technologies allow neural somatic mutations to be detected in any way relevant to predicting psychological traits in living individuals, much less intervening in any way. At most, techniques for somehow identifying somatic mutations in living individuals may be developed so we can at least assess how and how much this source of otherwise cryptic causation affects who we are as individuals. Somatic mutation and neurological traits. Part II. Relevant Somatic Mutation discovered? The first installment of this brief series discussed some possible manifestations of somatic mutation in helping to account for the biology and epidemiology of epilepsies. From a cellular point of view, epilepsies seem to be functionally close to gene action, but mostly have eluded gene mapping in families, GWAS, or mouse models. Yesterday, I referred to a paper that I published in 2005 which mused about the possibility that some epilepsies and other behavioral traits might be due to genetic effects that arose through somatic mutation rather than being inherited in the parents' germline, and I tried to suggest reasons why that idea seems plausible But finding direct evidence for relevant somatic mutation in relevant neural (brain) tissue, just a subset of cells, would have been technically very challenging. That was then, however, and technology marches on. A new paper by Wei et al. in the February 2016 issue of Cell ("Long Neural Genes Harbor Recurrent DNA Break Clusters in Neural Stem/Progenitor Cells") may suggest that we're getting to a point where it might be possible to address my speculation directly--and perhaps go far beyond that to understand epilepsies much better but, even more, to address variation in normal behavior and abnormal psychological function in general. Wei et al. report using a clever, sophisticated, if very technical method to make a systematic search for a class of somatic mutations in neural cells. The experiments are done in mouse cell culture and, basically, Wei et al looked genomewide for chromosomal changes or rearrangements that arise out of double-strand chromosomal breaks. The detail is far beyond what I could competently describe here, and would be out of place in a blog. 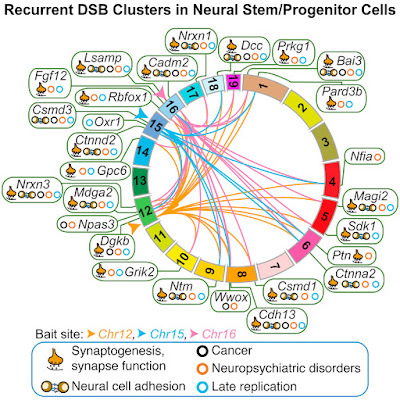 However, the upshot of their work is that the authors expanded on what had been known, that there are very large mutational rearrangements detectable in repeatable locations in the genomes of early neural precursor cells. As shown in the figure below, the rearranged locations are found genomewide, and on most chromosomes. The changes varied among cells tested. I am not qualified either to defend or critique the method itself, but have no reason to doubt the findings, and if anything it must be fair to assert that because the method only finds one sort of mutation, the finding implies that other methods would find expanded evidence for somatic mutation of various sorts in these cells, as are clearly known to happen in other cell types. The authors used methods that have passed muster before, they cite ample other literature on somatic rearrangements generally. Experiments like this are artificial in various ways, and theirs doesn't prove that the mutations they detected do in fact have phenotypic effects in vivo, but the case for that is certainly and strongly plausible. The importance of this finding, and what justifies its being published in Cell in my view, is that it shows not just tolerance of somatic mutation, but perhaps even active genomic modification in the early mouse brain. 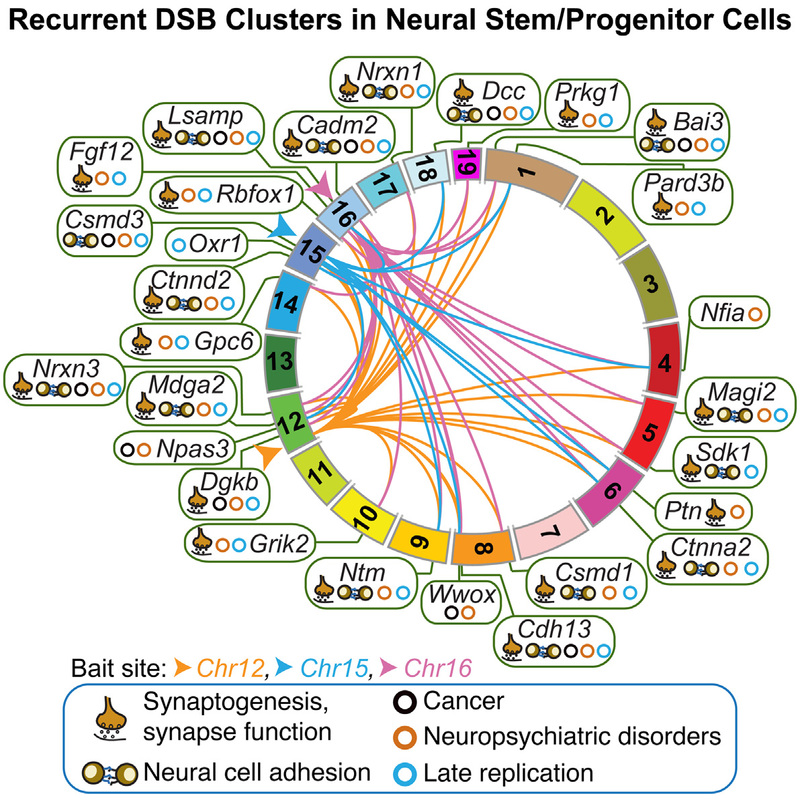 Moreover, the authors find that a major fraction if perhaps even preponderance, of the genes altered in this process, whatever other roles they may serve, are involved in neural cell adhesion and synapse formation and/or function. One can be properly skeptical about assigning function to genes (gene ontologies are often quite shaky and genes typical serve many functions), but even if there is a sort of after-the-fact bias in interpretation, the involvement in the modified genes in synapse function seems well established. For a partial summary of the approach, the original authors as well as a short, cogent and somewhat more digestible accompanying commentary by Weissman and Gage ("A Mechanism for Somatic Brain Mosaicism"), explain the potential this may have for the determination of individuality. This is speculation in detail, naturally, but the proto-neurons develop into relevant areas of the adult brain, and the authors note that the affected cells are, or reasonably may be, involved in a variety of higher functions. They mention learning and mental functions such as autism, bipolar depressive disorders, schizophrenia, and intellectual disability. They also speculate that the somatic changes could be relevant to various forms of cancers of brain cells. And, perhaps an artifact of the way science is done these days, I saw no mention of the obvious likely fact, that if these changes can be involved in disease they can also be involved in any other psychological traits. 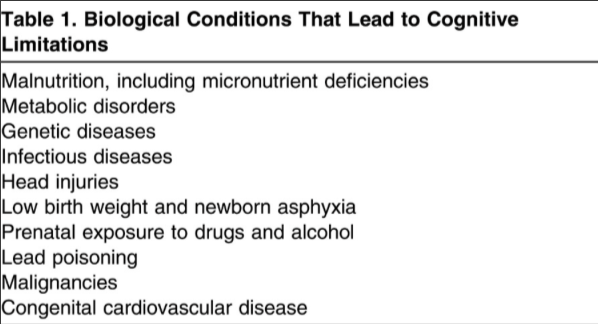 The authors also did not mention epilepsies, nor whether genes known or suspected of being involved in some epilepsies were detected in any of these rearranged regions. I'm not any sort of expert on that, but on a very cursory check, I did not spot any specific known epilepsy related genes in the above figure, but one can hardly take that as in any way definitive. Since epilepsy is itself relatively rare, only rare somatic mutational changes need be involved, for epilepsy to be an occasional consequence and to help account for the variation in the types and parts of the brain affected, the seriousness, age of onset, and so on. We'll see. In the previous post, I referred to to means of phenotypic amplification, a process by which mutations in a single or small subset of cells could reach organismal (whole-person) detectability or effect. 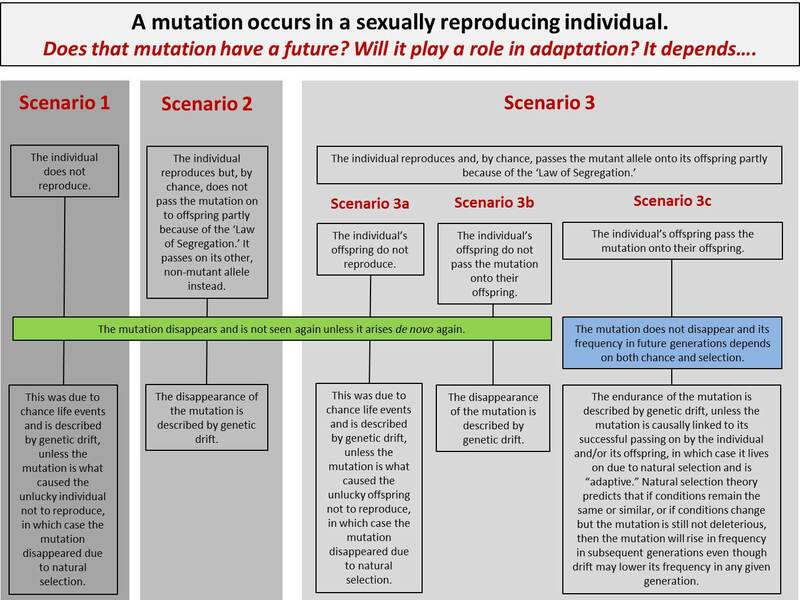 One means would be if a somatic mutation happens early enough in development for a large enough set of descendant cells to be affected, almost as if the mutation were inherited in the germ line. Given the n numbers of at-risk embryonic cells and the number of people produced each year, and the surely large number of genes that could have an effect on epilepsy (or any other psychological trait), this simply must occur! Depending on when in development the somatic mutation occurred, its descendant set could be general and bilateral, or could be restricted to a small part of the brain on just one side, depending on the way these tissues differentiate during development. 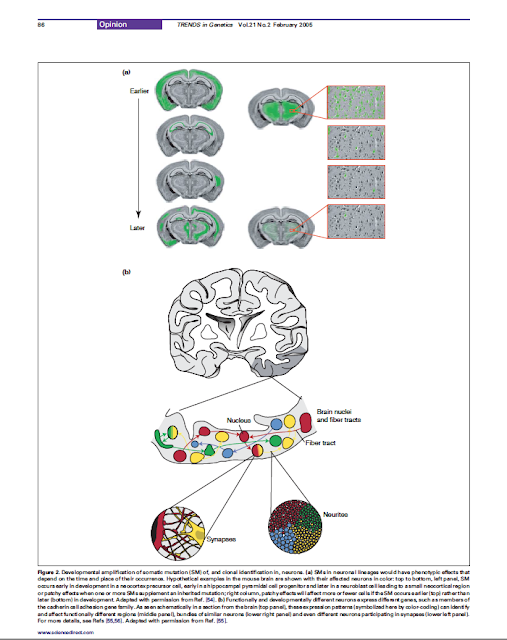 That is, the types of epilepsy that are focal, affecting only a restricted, identifiable part of the brain, might be susceptible to genomic analysis to identify the mutations (illustrated in the figure in yesterday's post). That is, the rest of the person's neural cells would not be mutated. The other method of phenotype amplification I mentioned yesterday could occur when one or just a few mutant, misfiring neurons misfires, and that then induces a cascade of firing in the many other neurons to which it synapses. This kind of phenotype amplification might not be easily detectable, because the single or few mutant culpable neurons might be invisible in sequences of the entire affected brain region, because most of the misfiring cells would, themselves, be genetically normal. That is, their misbehavior would be induced by the abnormal neuron(s) to which they were synapsed. The variable and usually highly restricted, focal nature of epilepsies (i.e., suggested in yesterday's figure) cries out for explanation that involves the unique features of these small areas. The methods in the Cell paper are very complex, technical, and certainly nothing I ever did in my lab, so I must acknowledge that my thoughts could be off the speculative mark. Still, the paper and others it cites show that the ideas have more than totally circumstantial support. There are lots of mutations in neural cells, as indeed, there are in any set of somatic cells. They affect the individual in which they occur but are not transmitted in the germ line and hence not discoverable by GWAS and family studies. No matter what one may think of the idea, a point worth making is that there is now at least one major study systematically documenting the pervasive frequency of somatic mutation of particular types (rearrangements), that is active, common, and genomewide in developing neural precursor cells (and the authors cite other relevant results). How or even whether a role of somatic mutation in epilepsy can be shown in real mice, much less humans, and not just cell culture or sequencing of the brains of deceased patients, is of course an open question. However, unlike 2005 when I wrote my speculations, high throughput and even single-cell sequencing are now at least beginning to be practicable in mouse models and deceased humans who had epilepsies of known focality and expression. If the ideas are cogent, investigators may find them compelling subjects to study. Searching for somatic mutational causes of traits that seem to have specific tissue locations, seems now at least more possible, inroads might be possible and could, in principle at least, lead to substantial advances in understanding the mechanisms involved, as well as the epidemiology and phenotypes of epilepsy. Epilepsies are disorders of cascades of uncontrolled neural firings. Local or large parts of the brain can be involved in seizures, and the affected person's functioning is seriously impaired until the wave or storm of 'undisciplined' synapse firing has passed....until the next episode. Epilepsy can be triggered by different stimuli in different people, and can affect specific parts of the brain, either quite localized or on just one side, or more general and bilateral. Epilepsies also have variable onset triggers and ages in different people. Waves of unconstrained neural firing seem to be related to signal transfers between connections between neurons (synapses) in the brain. Since signal molecules are basically genetic (that is, not dietary or due to exogenous chemicals), one would expect epilepsy to be basically 'genetic' in its basic causal physiology. Indeed, some epilepsies have long been known to result from mutations in single genes, occur in Mendelian fashion in families, involve neural signaling molecules, and some of these genes are known to cause epileptic symptoms when mutated in laboratory mice. But most epilepsies are sporadic, not obviously familial, and have resisted attempts to map the responsible genes. This was the general picture in around 2004, when I was asked to give a presentation to a meeting at NIH, of people working on epilepsy, to discuss what I saw as the general genetic causal landscape at the time. This was early in the age of GWAS and other genomewide approaches. I don't remember the details, but in my presentation I gave a general picture and issues in genetic mapping, and relevant evolutionary genetics. But I also wanted to make a contribution beyond just a review, and I had thought about the genetics, physiology, and epidemiological patterns of the epilepsies. I suggested what I thought would be relevant, based on previous work I had done over the years on the genetics of cancer and aging. Basically, I hypothesized that many epilepsies might, like many cancers, be due not to inherited mutations but to somatic mutations--that is, mutations in relevant genes that occurred in neural cells during embryonic development or later in life, rather than being inherited from parents. I found considerable interest in this idea, which I thought (and still think) could be a positive, potentially innovative way to understand the biology and epidemiology of epilepsies. Some interest was shown, and a leading epilepsy neurobiologist offered to work on a paper about this idea and how one might test for it. But for whatever reason, he lost interest before any paper could be published. Partly perhaps, that was because of the difficulty of testing the idea, which would have required identifying the specific misfiring neurons in epilepsy victims and, when they died, sequencing those areas looking for mutations not found in neighboring normal neurons. After my potential collaborator had more important things to do (or, probably, more important people to please) and dropped the idea of doing a collaborative review paper, I published my ideas in Trends in Genetics in 2005 (paywalled; if you're interested, email me for a pdf). With some helpful discussion with a then-junior colleague, Dan Burgess (now working at Roche, I believe), we thought about ways in which, depending on embryonic or postnatal age, somatic mutation in neural cells or their precursors, could generate epileptic effects. The idea is shown in this figure, drawn in collaboration with Dan, and taken from the paper. There are at least two main ways this might happen. First, a somatic mutation arising early in embryonic development in a cell that was the precursor of neurons, could set up that descendant lineage or clade of cells (and their respective part of the brain) to be vulnerable to uncontrolled firing, that is, to epilepsy. Alternatively, a single later-occurring mutation might make the affected neuron too ready to fire under some conditions, and that could entrain firing in the often thousands of other neurons with which it synapses, and their neurons in turn In a sense, such an episode could 'burn in' the synaptic connection in this set of neurons, all genetically normal except for the mutant triggering cell, making the set vulnerable to later episodes triggered by the original offending cell. The location in the brain of the 'parent' aberrant cell(s) and its or their synaptic network would determine the side and part(s) of the brain that were affected by the seizures. For somatic mutation to have detectable effect at the organismal level, there must be some sort of phenotype amplification, such that even a single or few aberrantly firing cells, that might on their own not be particularly noticeable would entrain enough other cells to cause a seizure. Cancers are now extensively studied for somatic mutation, because of their exuberant growth and histological characteristics. 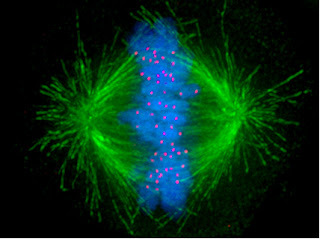 One transformed cell leads to a large number of descendant cells--a tumor. As noted above, aberrantly behaved neurons even if not individually detectable could, in principle at least, entrain so many other otherwise normal cells in a synaptic network, as to amplify the effect to make it noticeable to the person as a whole and to clinicians. Thus in a variant of the precedent of cancer, one mutant transformed neural cell early in the embryo may be unnoticeable in itself, but after millions of cell divisions it can lead to a clone of misfiring cells. With this sort of thing in mind, one can naturally also ask about a potential role for somatic mutation, arising in developing neural cells after fertilization in the embryo's later life, in other aspects of brain function--even including traits like intelligence, behavior, learning ability, memory, and personality, or other pathologies such as schizophrenia? Behaviors and especially behavior genetics are highly contentious areas. Some would like these traits and abilities to be due entirely to environments, while others are fervid in their belief that you are what you inherited in your genome--what you are is inborn. That was the view, of course, of the eugenics movement and it's still around today in the belief system of many. We've posted on this general topic before. The argument for inherency has always been assumed to be about germ-line genotypes, that is, inheritance from parent to offspring. But could similar effects arise by somatic mutation--or, rather, if they can be inherited how could they not in some instances be due to somatic mutation? Testing for somatic mutation in regard to brain function, even specific traits like epilepsy, has been prohibitively difficult, because specific somatic mutations would need to be identified systematically in specific brain areas or subsets of neurons. Detecting and characterizing somatic mutation in traits like epilepsy will be challenging and may not quickly lead to therapy, but it could at least illuminate etiology and mechanisms. At least, the idea that I laid out (and others may have as well, though not that I know of), hasn't been tested. But that may be changing, as we'll discuss tomorrow. 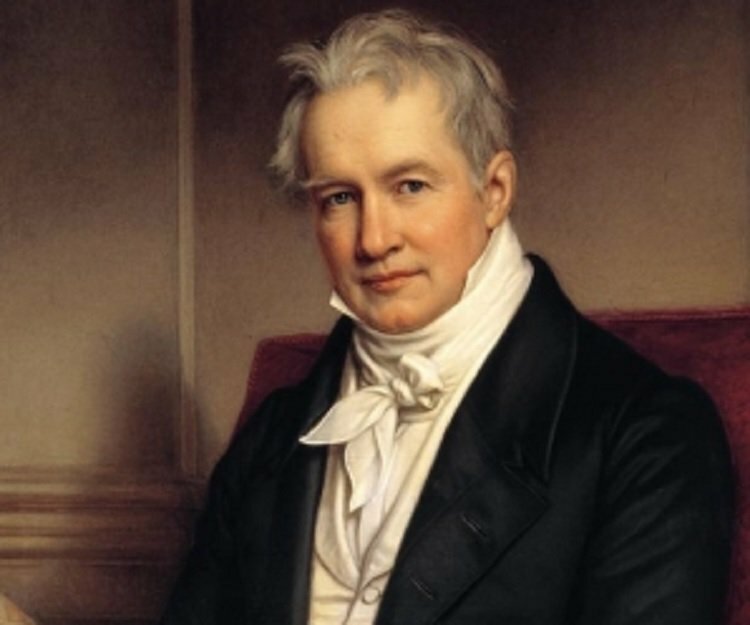 I was motivated to write this post by reading Andrea Wulf's The Invention of Nature (Knopf, 2015), a new biography of Alexander von Humboldt. It's a fine, well-written book that I highly recommend. Humboldt was a daring explorer and adventurous man, whose elegant, voluminous, and prolific writing about travels to South America in early1800, and much more, influenced a century of others. If you want a taste of his life, read his fascinating Personal Narrative of a Journey to the Equinoctial Regions of a New Continent, where he describes his travels to the deep, tropical Orinoco basin. After that, during the same trip, he and his companions also climbed the tallest mountain in the Andes. He was an amazing person! Humboldt effectively advocated holistic approaches to Nature, what we might today call integrated ecosystem rather than a molecular reductionist view of life: Nature cannot adequately be understood by being parsed into its local material components, because everything interacts with everything else and must properly be understood as a whole. During his long live, he compiled enormous amounts of meticulously detailed data and synthesized his findings in a stream of globally influential publications. Humboldt noticed various common threads in Nature, for example, the similar botanical ecozones that are found in different parts of the world, based on criteria such as climate. Thus, similar plants types could be found in the similar climates of high elevations in the tropics and at sea levels in the distant cold polar latitudes. Humboldt stressed the importance of getting out into Nature, to observe what is going on first-hand rather than staying at home and trying to think out the nature of Nature from abstract principles. Academic ivory towers were not for him. Among the many notable people who came under the spell of his writing were Charles Darwin, Ernst Haeckel (Darwin's German advocate), Henry David Thoreau and his Walden, John Muir (the conservationist), George Marsh (conservationist who warned about the dangers of deforestation) and, generations later, others like Teddy Roosevelt and Aldo Leopold (due to my limited knowledge, this is a very incomplete list of luminaries from a much longer roster). Besides stimulating great discoveries in the 19th century age of exploration, Humboldt himself and many he inspired warned of disaster, if not doomsday, as a result of humans' relentless ravaging of an Earth that had recently been a sustainably pristine natural wilderness. We must return to Nature, so to speak, and do something to reverse our destructive tide. Or else! In the two centuries since Humboldt, waves of similar concerns have percolated through literate European culture. In my own lifetime, I have seen at least two major tides of this sort. Younger readers may not know of the environmentalist movement beginning in the 1970s, including doomsday scenarios of Paul Ehrlich's The Population Bomb about overpopulation, the global environmentalism of Barry Commoner, the Whole Earth Catalog, Earth Day, and a more general urge that we simplify and scale down: "Small is beautiful!" (even in the US if you can believe it, where bigger is always better! ), communes of flower children with their flower-decorated VW buses, among many other aspects of the counterculture movement. I even remember reading that we'd be out of copper by the year 2000. Cars were smaller, replacing gas-guzzlers. The threats had scientific support, were widely portrayed by activists as imminent: one could feel the sense of urgency. Act now, before it's too late! Eventually, most hippies tired of yurt life (pot or no pot) and left the woods and mesas to go to graduate school, become lawyers and moved to suburbia. Basically, American life moved on, or one may say kept on, more or less as before. Now, decades later, there is a new generation of environmentalist reactions, to industrialized agriculture, GMO crops and destructively unsustainable agriculture, overpopulation, relentless growth, and the overarching threat of climate change due to the carbon emissions our profligate ways generate. We're going to exhaust the soil, and drown the coastlines as the glaciers melt, unless we take urgent action! Over the decades there have been successful responses to specific avoidable threats, such as from DDT, ozone-damaging refrigerants, environmental lead and exhausts, and others. These aren't to be minimized. However, the problems have been rather focal and easily fixable, rather than being imminent cosmic risks that would require serious changes in how we live. There are clearly people willing to walk the walk by trying to make at least some eco-friendly changes in their own lives, such as by adopting small-scale organic farming, or becoming vegan, and solar heating. However, to me, an objective assessment would be that this is largely symbolic tinkering around the edges. I say this rather pessimistically, because to me history shows that not many people are willing to make the deeply downscaling changes required to reverse the threats. I think that most of us are so entwined in industrialism and urbanization and so on, that truly profound reforms aren't realistically possible, except under real duress. In that sense I, perhaps typically skeptically, view Priuses and LED light bulbs as not empty or useless, but as largely symbolic gestures (I'm personally no better!). Indeed, even today, the moment the price of oil drop, car companies immediately begin promoting--and successfully and profitably selling--their big SUVs and pickups. I think it may also be fair to say that, sociologically, the people pressing the environmental issues are largely the privileged middle class, with our protections and options, while the majority face enough challenges just to make ends meet, much less to scale back. I won't win any friends with this post, but if you think this is too pessimistic, then why have wave after wave of these views passed on through, while overall the ecological problems have actually become much more, rather than less, marked? Is today's "Save the Earth!" really different from past slogans that have faded into history, or indeed, though you may not think of it that way, rather like millenarian or apocalyptic movements that in a sense express a desire people have to be making a difference in specially Important times? It's not just that most people can't individually do much about threats like global warming even if they wanted to. The severity or imminence of the threats themselves is itself debated. The hated industrialists of Monsanto and other conservatives, even if in gross self-interest, insist that biotech and solar power, or CO2-capture and science generally, will save the day--if indeed it needs saving. They point out that 7 billion of us could be fed if we but fixed the distribution system, so that the problem is political not ecological. And they point out that we're indisputably living longer and better by far than in the past. In an objective sense, despite rising global temperatures and so on, they have been right so far. At worst, skeptics might say, yes, with climate change lots of people may live in polluted or abject poverty--but they always have. Soils have been exhausted before, civilizations have come and gone, but people and civilization itself have persisted. So what if global warming means that New York and New Orleans go under water? People will move! Resource wars? What's new? After all, in Humboldt's 1800s (and before), deforestation was real and could lead to local desiccation, but also meant available cleared farmland, timber for fuel and building and heating and railroad ties and ship masts, that brought faraway goods, and so on. The element of the middle class that has been doing all the hand-wringing is in fact currently doing just fine by almost any historical standard. Would you trade your lifestyle for your grandparents' or even your parents'? Meanwhile, waiting impatiently in the wings, people in India and China, not to mention Africa, understandably want to live the way we do, not the other way round. In that sense what to me seems to minimize the behavioral impact of these issues may have to do not with whether the issues are real, but their degree of imminence. If we want to be scientists rather than just advocates, isn't a reality that people simply cannot, or will not, seriously cut back their lifestyles unless they face a palpably imminent, not just abstractly distant disaster scenario? Can we even act local, much less think global? I live in State College, Pennsylvania, a university town. Penn State has an Institutes of Energy and the Environment, as well as prominent climate-change research faculty. Our College of Agriculture has active sustainable agriculture programs. The town has an active green community, local CSAs and farmer's markets, and at least one locally-sourced-only restaurant. The university uses recycle bins, is changing to greener sources of heating, and there are motion sensor lights that go off when nobody's in the halls or bathrooms. Yet how serious is all of this? That same university has been selling land and in other ways acquiescing to 'developers', who turn good farm land into hundreds of McMansions and condo complexes, with lots of internal space to heat and cool, and external space to drive through for any shopping, major or minor. Even here, where relevant knowledge is actually being generated, the growth ethic nonetheless rules. 'More!' is the main operative word when you get right down to it. This is not a particularly culpable local situation: I see the same growth ethic everywhere I go in the US, north, south, east, and west, and, indeed, in Europe, and for that matter in every university, too. The financial pages seem still to believe--is that the right word?--that growth is vital. There is little sign of lifestyle restraint much beyond changes of a rather easy, mainly symbolic nature. Pessimism, or realism, or....what is to be done? I hope I'm missing something! Maybe we can have our 'more!' yet somehow reduce consumption, and be sustainable. The ecological and climate threats seem entirely real and the likelihood of serious conflict for resources in the future is, by any historical precedent I know of, not just being imagined. Things may indeed implode on our descendants. But threats to generations a century from now just don't seem to 'stick' when comes to serious lifestyle changes. Energized young people age and tire and are absorbed by the gravitational pull of our culture. That is why reading about Humboldt's era led me to wonder about current ecological issues and ask whether we should or can expect this iteration to be different. Major change won't happen just because the latest wave of advocates, even passionate writers in the likes of earlier authors like Alexander von Humboldt and John Muir, insist that the current round of environmentalism is the real one. At the very least, if the threats themselves are truly urgent, it's fair, or I would say perhaps itself urgent, to anyone who would like real lasting change to happen, to ask candidly if, or how, this time environmentalism can be more than another passing cycle: Are sustainability movements themselves sustainable? Thanks, Darwin, for teaching me to ditch the damn clippers and just bite my baby's nails. In honor of the occasion I'd love to share my favorite Darwin thing. "A critic, without any grounds, disputes the possibility of this act ... for the sake of discrediting my work. Therefore I tried, and found that I could readily seize with my own teeth the sharp little claws of a kitten nearly five weeks old." O! How I wish that spirit is what "Darwinian" actually referred to. Cheers to one and all on this very merry Darwin Day, 2016! If mutations can go viral, adaptationism is less annoying. Feb. 9, 2016: I have edited the paragraph beginning with "Exciting..." to remove details of mutation rates because my initial posting was probably wrong about coding vs. non-coding mutation rates. To fix that requires much more nuance than is relevant for the point I'm making in that paragraph, not to mention much more nuance than I'm capable of grasping immediately! Cheers and thanks to Daniel and Ken in comments below and to everyone who chimed in on Twitter. I always account for virally-induced mutation when I imagine the evolution of our genome. That's because I'll never forget this quote. Who could? Exciting virus discoveries aside, we're constantly mutating with each new addition to the human lineage. Thanks to whole genome sequencing, the rate of new mutation between human parent and offspring is becoming better known than ever before. We each have new single nucleotide mutations in the stretches of our DNA that are known to be functional (very little of the entire genome) and that are not (the majority of the genome). These are variants not present in our parents’ codes (for example, we might have a ‘T’ where there is a ‘A’ in our mother’s code). And there are also deletions and duplications of strings of letters in the code, sometimes very long ones. Estimates vary on parent-offspring mutation rate and that's because there are different sorts of mutations and individuals vary, even as they age, as to how many mutations they pass along, for example. Still, without any hard numbers (which I've left out purposefully to avoid the mutation rate debate), knowing that there is constant mutation is helpful for imagining how evolution works. And it also helps us understand how mutations even in coding regions aren't necessarily good nor bad. Most mutations in our genome are just riding along in our mutation-tolerant codes—where they will begin and where they will go no one knows! And it's with that appreciation for constant, unpredictable, but tolerated mutation—of evolution's momentum, of a lineage's perpetual change, selection or not—on top of a general understanding of population genetics that just makes adaptation seem astounding. It makes it difficult to believe that adaptation is as common as the myriad adaptive hypotheses for myriad traits suggest. That's because this new raw material for adaptation, this perpetual mutation, really is only a tiny fragment of everything that can be passed on. But, what's more, each of those itty bitty changes could be stopped in its tracks before going anywhere. The Brief or Wondrous Life of Mutations, Wow. This view of mutation fits into that slow and stately process that Darwin described, despite his imagination chugging away before he had much understanding of genetics. Of course, bottlenecks or being part small populations would certainly help our rogue underdogs proliferate, and swiftlier so, in future generations. Still, trying to imagine how any of my mutations, including any that might be adaptive, could become fixed in a population is enough to make me throw Origin of Species across the room. By "adaptive," I'm talking about "better" or "advantageous" traits and their inherited basis ... that ever-popular take on the classic Darwinian idea of natural selection and competition. 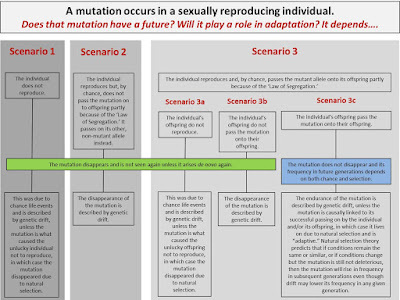 For many with a view of mutation like I spelled out above, it's much easier to conceptualize adaptation as the result of negative selection, stabilizing selection, and tolerant or weak selection than it is to accept stories of full-blown positive selection, which is what "Darwinian" usually describes (whether or not that was Darwin's intention). One little error in one dude's DNA plus deep time goes all the way to fixed in the entire species because those who were lucky enough to inherit the error passed it on more frequently, because they had that error, than anyone passed on the old version of that code? I guess what I'm saying is, it's not entirely satisfying. But what if a mutation could be less pitiful, less lonely, less vulnerable to immediate extinction? Instead, what if a mutation could arise in many people simultaneously? What if a mutation didn't have to start out as 1/10,000? What if it began as 1,000/10,000? That would certainly up its chances of increasing in frequency over time, and quickly, relative to the rogue underdog way that I hashed out in the figure above. And that means that if there was a mutation that did increase survival and reproduction relative to the status quo, it would have a better chance to actually take over as an adaptation. This would be aided, especially, if there was non-random mating, like assortative mating, creating a population rife with this beneficial mutation in the geologic blink of an eye. But how could such a widespread mutation arise? This sounds so heartless to put it like this, but thanks to the Zika virus, it seems to me that viruses could do the trick. 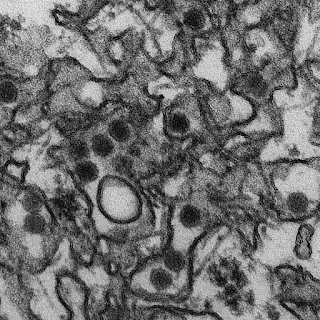 I'd been trapped in thinking that viruses cause unique mutations in our genomes the way that copy errors do. But why should they? If they infect me and you, they could leave the same signatures in our genomes. And the number of infected/mutated could increase if the virus is transmitted via multiple species (e.g. mosquito and human, like Zika). If scientists figure out that the rampant microcephaly associated with the Zika virus is congenital, wouldn't this be an example* of the kind of large-scale mutation that I'm talking about? *albeit a horrifying one, and unlikely to get passed on because of its effects, so it's not adaptive whatsoever. If viral mutations get into our gametes or into the stem cells of our developing embryos, then we've got germ-line mutation and we could have the same germ-line mutation in the many many genomes of those infected with the virus. As long as we survive the virus, and we reproduce, then we'll have these mutant babies who don't just have their own unique mutations, but they also have these new but shared mutations and the shared new phenotypes associated with them, simultaneously. Why not? Well, not if there are no viruses that ever work like this. We need some examples. The mammalian placenta, and its subsequent diversity, is said to have begun virally, but I can't find any writing that assumes anything other than a little snowflake mutation-that-could. Anything else? Any traits that "make us human"? Any traits that are pegged as convergences but could be due to the mutual hosting of the same virus exacting the same kind of mutation with the same phenotypic result in separate lineages? I've always had a soft spot for underdogs. And I've always given the one-off mutation concept the benefit of the doubt because I know that my imagination struggles to appreciate deep time. What choice do you have when you think evolutionarily? However, just the possibility that viruses can mutate us at this larger scale, even though I know of no examples, is already bringing me a little bit of hope and peace, and also some much needed patience for adaptationism.